A body has been found in the search for a British GP who went missing after a hike in the French Alps. 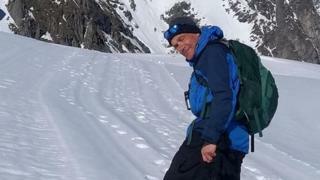 Robert Bailey, 63, worked at a practice in Peterborough, but had not been seen since he went out walking in Les Houches, near Chamonix, on 22 March. It has not been confirmed when the body was discovered, but the Mirror Online reports it was found on Tuesday. The Foreign Office said it was "supporting the family of a British man who has died in France". Dr Bailey had been hiking in an area at the foot of France's highest peak, Mont Blanc, which lies on the border with Switzerland and Italy, and is popular with skiers and climbers. He was a senior partner at Minster Medical Practice in Princes Street, Peterborough, and was the clinical lead for end-of-life care at the Peterborough & Cambridgeshire Clinical Commissioning Group (CCG). Dr Gary Howsam, clinical chair of Cambridgeshire and Peterborough CCG, said: "Our thoughts are with Dr Bailey's friends and family at this sad time as well as his colleagues and patients. "Rob was a well loved and respected GP and all those who worked with him will miss him deeply." A Foreign Office spokesman said: "Our staff are supporting the family of a British man who has died in France, and are in contact with the French authorities. "They have our sympathy at this deeply difficult time."